This post comes with a warning... it's rather long, so you may want to grab a cuppa before embarking on it... ! The day finally arrived. 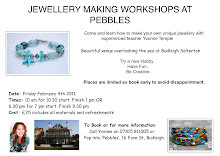 Many hours of preparation, inspiration and making came together in this one event... The Great Create. I was relieved that the day finally dawned and I was going to be able to see the end result and hopefully have a fruitful time. We packed up the car the night before.. it was literally groaning under the weight... and then tucked in for a good nights sleep. Saturday morning came and the sun was shining, the sky was blue, and we set off on our way to Greenway House on the banks of the river Dart. The journey there was idyllic... crossing the dart on the lower ferry ... I will have to post some pictures of that one day as it is so beautiful looking out to sea beyond all the colourful boats bobbing up and down in the water.... and then trundling down the leafy Devon lanes, catching glimpses of the Dart through the trees, to Greenway. 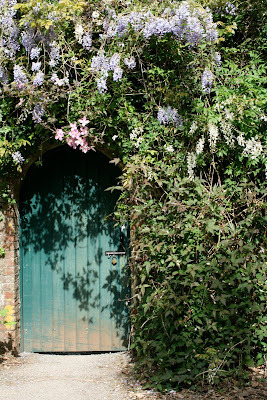 I don't know about you but I love doorways... the wonder of what might be behind and what will open up to you as you enter... a world of possibilities! ... and this was the door that was awaiting being opened for us to enter and set up. Inside was the most amazing walled garden. It was such a quiet, peaceful, beautiful place to be..
Once we were in and our ideal spot chosen, we began the task of unloading the car and setting up. I was so thankful to have borrowed my parents gazebo - it's one of those eze up ones which really are so easy to put up... grab a corner each and pull and hey presto... it's up!! I felt a little mean ( or was it smug!!) as I heard the other stall holders muttering about number 5 poles fitting into number 6 poles and then standing back to scratch their heads whilst the poles lay scattered over the ground! 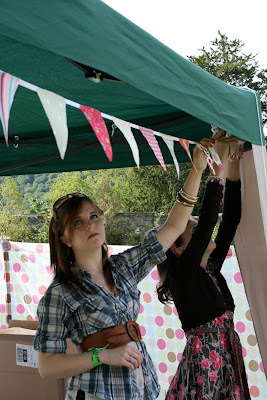 Anyway, as you can see the girls, Harriet and Rosie were real stars... they worked really hard at helping to set up, and as you can see were experts at putting up the bunting - just as well really as we had to dismantle the whole stand every night and then put up again the following morning! 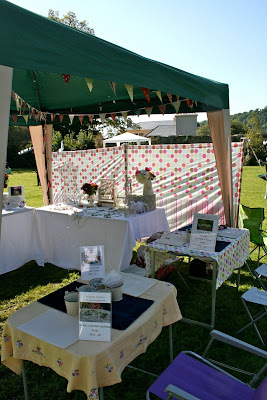 I love this windbreak... it's a great background for the table... and doesn't the bunting look good with it too??? 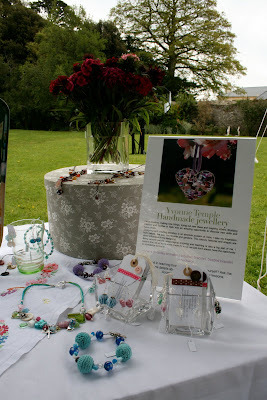 We set up two tables for people to sit at if they wanted to have a go at making either a button bracelet or a beaded memory wire bracelet... as it was, not many people took the opportunity to sit and make, which was a little disappointing, but it meant that the girls and I had somewhere to sit and wile away the time making jewellery. 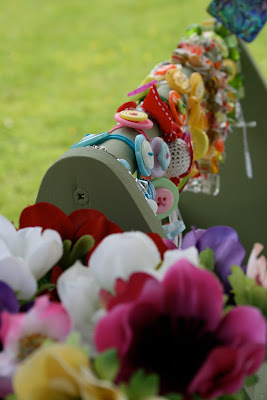 Here are some of my bracelets displayed on the handle of an old wooden trug that I re-painted... credit goes to Harriet for taking this photo! Caught on camera.. Harriet snapping again! By this time I had already met some really lovely ladies. 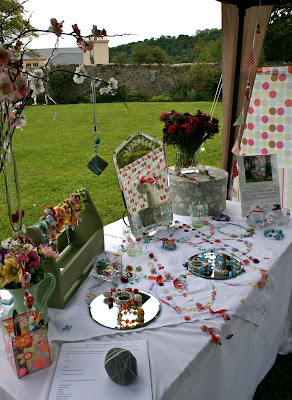 One particular group of ladies were having girly weekend in the South hams and were enjoying their visit to Greenway and especially visiting my stand!!! When I met them I was wearing a particularly beautiful necklace that I had only just made that week and was really pleased with it... I was asked it if was for sale... well.. what could I say? 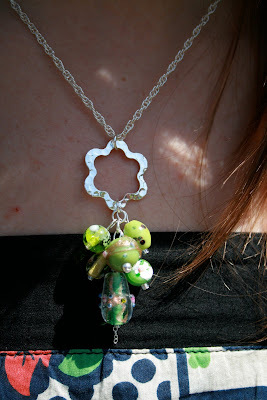 So that necklace was sold to a very happy customer. I put on another necklace, only to have another of the ladies from the group ask if that one was for sale too!!! Well, by this time we were having a great banter together and I asked if she wanted my dress too!!!! Needless to say that I sold that necklace to her and others to the rest of the group... if you are reading this ladies... thanks for making my day, it was a real pleasure to meet you and I hope that you had a brilliant weekend... keep in touch! 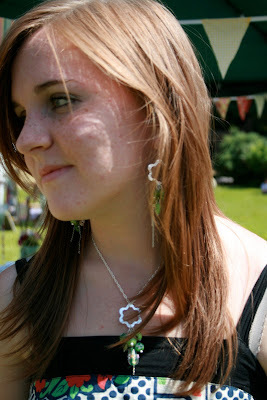 Harriet was inspired to make a necklace and matching pair of earrings.. 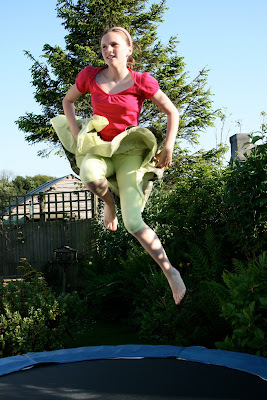 Some quiet time at the end of the day to do some posing... the garden was full of sculptures..
Rosie obviously still did not feel tired at the end of the day as she had the energy to have a bounce on her trampoline!.. ...... followed by a snooze on the sofa!!! It has definitely been an interesting weekend. The setting was stunning, the weather was perfect, the people I met were really lovely, I had some amazing encouragement and feed back, however, the numbers were very low and I was a little disappointed in the turn out. 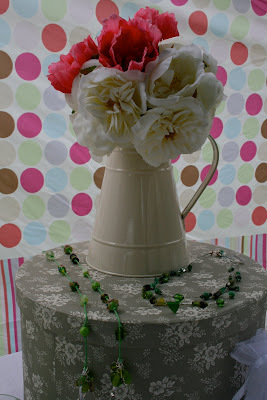 I now have buckets of buttons and beads... workshop anyone?? One of the most enjoyable parts of the weekend was spending time with Harriet and Rosie, chatting together, laughing together, making memories, being creative together and working together as a team. It was such a privilege to have that special time with them, so I am very thankful for that. I didn't know anything about this event so have been reading all about it..I must make an effort to come along next time!! Oh what a lovely event, too far away for me. 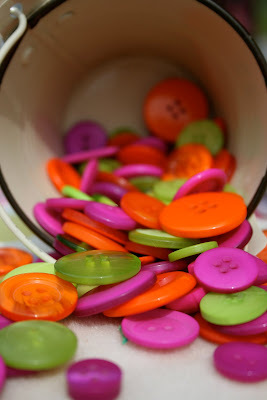 I would have loved to make a button bracelet as well!! Still it's so dissapointing when its such a low turn out all that effort!! Thanks so much for the lovely comment you left on my blog. I am fairly new to blogging and etsy so not sure if I am the best person to offer advice! I am learning, and have made a few mistakes (most notably setting up an ebay business account - don't do it, it's hideously expensive!). 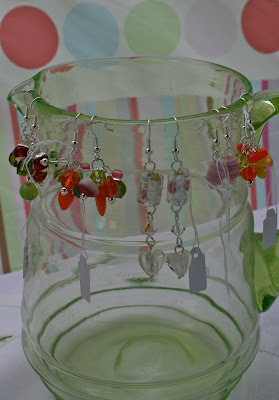 I have only been using Etsy for a week, but it is free to set up a shop, and there is the opportunity to customise your profile and shop banner etc. It costs nothing to do this! It only costs 20cents to list an item for up to 4 months (unless it sells sooner) which to me is MUCH more reasonable than ebay! Lots of people with blogs tend to use Etsy as opposed to ebay or other selling sites, so I'm hoping it will be useful for me! I love the pictures from your weekend! I so wish I had something like that near me! 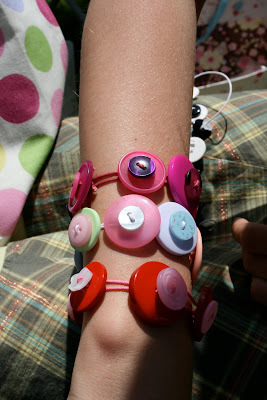 ooo.. how do you make button bracelets?? and where do you get all your buttons from?